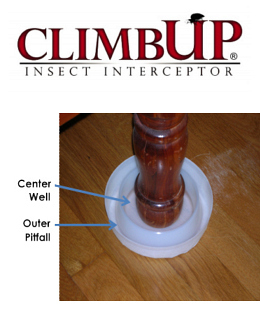 Learn where to buy the ClimbUp© insect interceptor, an innovative tool to safely monitor bed bugs. Feel safe using the ClimbUp© for bed bugs as it uses no chemicals and is environmentally friendly. The ClimbUp© insect interceptor forms a barrier between floor and bed. Bed bugs approaching bed from room will climb up exterior surface and fall into the outer pitfall ring. Wholesale Clients Only may gain to our Online Store, or Request Access. Owner Susan McKnight explained the new product change, "I have made a major change in my products. Last year I switched from using to polyethylene to mold ClimbUp to no-break polypropylene and I polished my molds to high mirror finish. 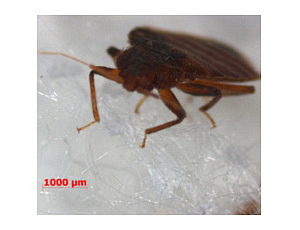 I have been getting researchers to test bed bug retention in the new product without adding talc. 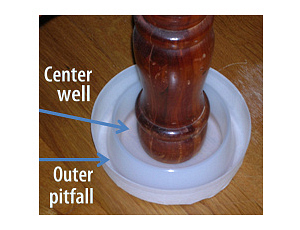 The new product is slick enough to keep the bed bugs in the capture wells without talc." Bed bugs approaching bed from room will climb up exterior surface and fall into the outer pitfall ring. Bed bugs climbing down from bed will be found in center well. Bed bugs and integrated pest management. Directions for use, in English, Spanish and French. ClimbUp® insect interceptor product photos.